What is a creative director, anyway? A creative director is a person (preferably) in charge of the creative vision of a project — the "concept whisperer." Thus, creative direction requires creating concepts (ultra compact, complete stories if you will), may they be intended to be seen, read, or heard. How these concepts are put together, in terms of the visual design, copy style, and everything in-between, rests upon the shoulders of the art director; he or she oversees the designers' work. And the way the concept is conveyed to the art director can make the difference between a healthy process, in which all parties concerned feel fulfilled, or malaise, resentment, and even mutiny! In other words, a creative director should master the arts of mentoring and critiquing; regardless of how great a concept is, the end result depends on effective communication. Only then, can everyone wake up wanting to come to work! Let me illustrate by using a real-life example involving a project I worked on as a freelance creative director on behalf of a marketing and design communications agency (Imago Inc., based in Alexandria, VA). Although it is a relatively modest piece, due to budgetary limitations, it represents how a little ingenuity and teamwork working seamlessly can go a long way in serving the client's needs. 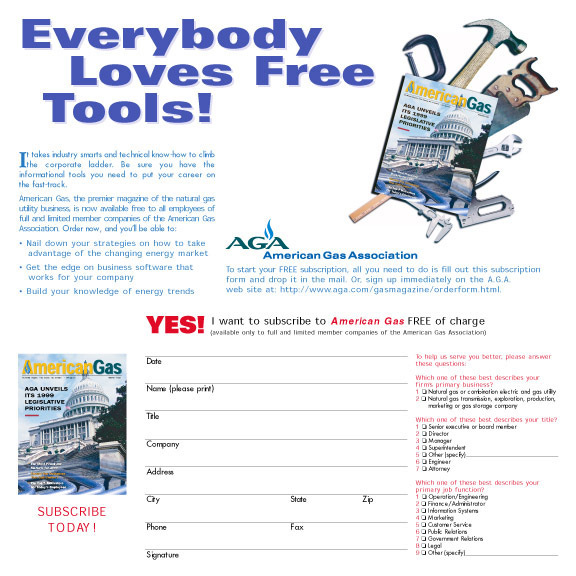 Imagine in this case that you are "American Gas" magazine and you wish to launch an ad announcing that your magazine — once available only to upper management via a hefty subscription — was now free of charge to middle management. One problem, however: you really don't have plenty to spend on the ad because, as it turns out, giving away free magazines is not cheap! At this point of the game, my role as the creative director was to act as the catalyst by asking the right questions that ultimately lead to an epiphany — in terms of "the story." In other words, we needed a hook of some sort; that "aha!" moment with regard to the concept. Hence, and before talking about style, design, and color, there was the matter of collecting relevant information, processing it, and coming up with a creative direction for the copywriting aspect of the problem. In other words, I strongly believe that if an ad cannot stand on the merits of its copy alone, then no amount of graphical design can salvage it. Yes, I know, graphics matter; a lot. But words matter even more. In any case, Imago's vice president of marketing — Theresa Daniel — and I guided her client through the task of identifying the parameters of the problem. We brainstormed and on that particular morning, as the three of us were having breakfast in the client's kitchen, I said: "So, would you say that this magazine is akin to a tool box that can help you build your corporate ladder?" What followed were the logistics: we returned to Imago where I met with Meg Carpenter, a great copywriter, and basically painted the picture for her. I gave her the key points I felt she needed to include. I wanted to make sure she got excited about the project as well. And if for some reason she wasn't, or she felt that a key "hook" was missing, it would have been imperative to discuss it. Luckily, it was one of those cases where everything fell into place beautifully and she flew with it. Then, I met with the two designers and asked them to make the magazine look like a tool box — using whatever limited means the meager budget allowed. That is what a creative director does; it's not (necessarily) about rolling up my sleeves and designing. As I mentioned in the beginning, in a typical agency environment, that responsibility would fall under the art director's jurisdiction. Leading up to that, I should undergo the process that would enable me to convey to the latter the concept we're using as the foundation for the ad. Of course, in many cases, the roles of creative and art directors will overlap. Nothing frustrates a designer or an art director more than not having true creative direction. The best thing any creative direction can do is stay out of the designer's way and not micromanage. Sure, if you see a designer creating a communications piece that screams "potatoes" when your client is selling "tomatoes," then, by all means, RE-DIRECT his or her focus. Only intervene if you feel the integrity of the message has been seriously compromised, may that be through a misuse of certain color combinations, improper image positioning, bad punctuation, and everything in-between. Lastly, be a team leader and a mentor who empowers each participant to take ownership of his or her own contribution — the only way to inner fulfillment and, ultimately, a happy client.